Brake caliper shims can help you dial in how quickly your brake pads grab the brake rotor. These shims come in two different sizes, a 1/32" and a 1/16" allowing for easy changes with precise comfort. These MCP Caliper Bleed Screw are the fast, easy alternative to getting your brakes bled. These screws work with the MCP Billet, Cast, and MiniLite braking systems. This cast brake caliper from Martin Custom Products is used on most 4 cycle applications in modern Margay karts. This caliper assembly comes with everything you need to stop on a dime in no time. These metallic brake pads are designed to be used with the MCP Cast Caliper system. They are easy to install and should help shed some tenths under braking. This caliper rebuild kit is designed to rebuild the MCP Cast brake caliper system. It comes with two pistons, and 2 piston o-rings, and should help restore some stopping power in your old caliper. 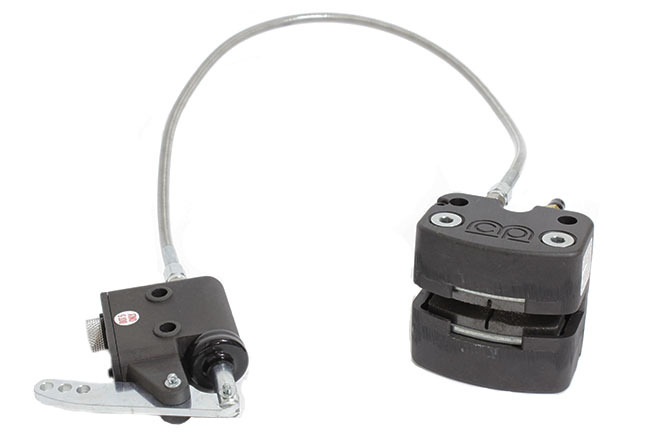 This 5/16 x 18 brake pad adjuster assembly is designed to be used with the MCP Cast caliper system. It allows you to help dial in the throw of you brake pedal by allowing the pads to grab quicker or slower than their current setting.